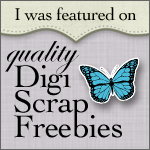 Edite to add: The stamps used to create this project are in the Best Witches Cling Stamp Set. The Halloween kits are no longer available. I really love the papers that come with the Halloween Kits in the Paper Garden Projects Store. The colors are so nice and mellow, yet still fun! I thought I’d share another treat holder idea. I love pocket cards for little treats, but sometimes if my treat is thick (like the baggie of M&M’s I’ll be using here), either I can’t get it into the pocket, or it strains the adhesive on the pocket edges so much that sometimes it starts to pull apart. 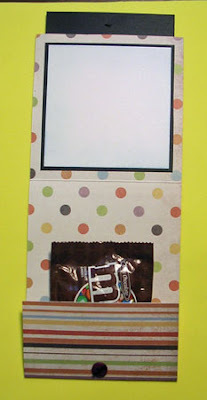 For this card, an envelope is used to create a gusseted pocket inside the card to hold the treat. The card is held closed by wrapping embroidery thread around two buttons. For the card, all the supplies needed are included in the Best Witches card kit, except for embroidery floss, an envelope and adhesive. 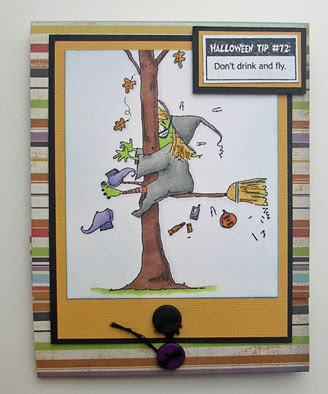 Stamped Don’t Drink and Fly Witch, colored as you desire and cropped to 3 ¾”high by 3 ¼” wide. 3 ½” by 4 ½” matte of Honeycomb for image. 3 ¾” by 4 ¾” Raven Matte for image. Stamped Halloween Tip sentiment cut out and mounted on Honeycomb and then Raven paper. 3 ¾” square matte of Raven for inside. Seal the envelope shut and cut off 2” parallel to the short side. You should have a little pocket 4 ½” wide by 2” high. Fold the sides of the envelope in to create a gusseted pocket. Don’t worry if it is not perfectly neat, it will be hidden. Mount the image on the Honeycomb and Raven Mattes as shown. Attach a button to the bottom center of the Honeycomb matte with embroidery thread. Score the strip of Pixie Stick paper at 2 ¼” and 7 ¾”. Fold the short area up and the longer area down to make the pocket and card top. 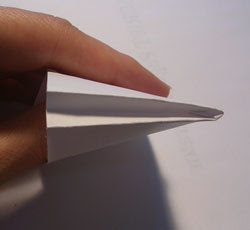 Attach the second button just above the bottom fold – through one layer of the paper only. 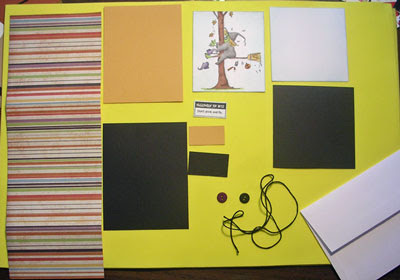 Adhere the white square and the Raven matte to the inside of the card. This will give you a place to write a message. Adhere one side of this envelope pocket you made in the first step to the card base just above the score line. Adhere the other side to the cardstock flap. Your envelope pocket should now form what looks like a mini accordian file in the bottom part of the card. Tie a length of embroidery thread to the button under the image. You can hold the card closed by wrapping the tread around both buttons – just like the old envelope closures. I hope this project is not too “scary”. If you make one please let me know, I’d love to see it! This entry was posted in Rubber Stamp Projects, Tutorials and Quick Tips and tagged Copic Markers, Eat Cake Graphics, treat bags, tutorial on September 10, 2008 by Cathy. This is adorable! Thanks for including photos as I’m such a visual learner. I might try one of these soon. Maybe. Hello from WA state. It has taken me this long to find you in the Blogiverse (lol). I met you while you were in Seattle at the Copics Certification Class. I still have some of those great images that you let me stamp while you were there. Absolutely darling! And your tutorial is wonderful. I think I have just “found” what to make for my DD preschool class! Thank you so much!